In 1965, Jack and Jamie Davies discovered the run-down Schramsberg winery on a mountainside above St. Helena. Their son Hugh was born the same year. The historic Schramsberg winery and vineyards had been abandoned for years; the antique Victorian mansion looked down on the tangled remnants of what used to be gardens behind which were the gaping entrances to Jacob Schram’s underground cellars hand-dug by Chinese laborers. The original Schramsberg, as run by founder Jacob Schram, had made a number of different wines but had never made any sparkling wines. The Davies wanted to make sparkling wines with richness and complexity using the authentic Méthode Champenoise process – wines that would be as “expressive as any of the great Champagnes – delicate, yet possessing distinct individuality and style.” They replanted the vineyards and began growing grapes. They began making wine from purchased grapes in 1965. 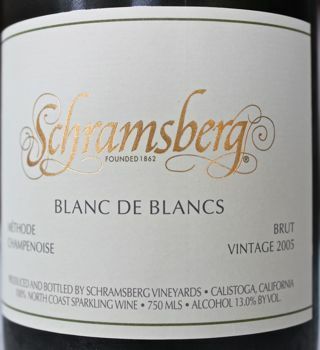 They say that their 1965 Schramsberg Blanc de Blancs was the first use of Chardonnay in an American sparkling wine made in commercial quantities. Their 1967 Blanc de Noirs was the first American sparkler produced using Pinot Noir as it is used in Champagne. Their Reserve – with over four years of aging en tirage – quickly became known as “the finest sparkling wine made in the United States.” In 1992, the J. Schram (1987 vintage) was introduced as a complement to the Reserve (tete de cuvee) of the Schramsberg range. 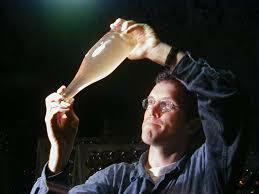 In 2005, Hugh Davies took over as CEO of Schramsberg and continues the family tradition. Many of the Schramsberg cuvees receive partial barrel fermentation and aging as well as partial malo-lactic fermentations to add depth and richness to the finished wine. There is no question that Schramsberg is performing at the top most level and enjoys the best reputation of all the US bubbly producers. A 12.5% alcohol, 100% Chardonnay (60% Napa, 37% Sonoma, 2% Marin, 1% Mendocino) methode champenoise sparkler including small lots of malolactic and barrel-fermented wines, aged on the yeast lees (en tirage) two years prior to disgorgement. Straw in color and fully sparkling; dry, medium-bodied with fresh acidity. Fresh and fruit driven with good yeast. Lots of citrus and some riper tree fruit. Fine integration of yeast, mineral and fruit. Opens well in the mouth and with time in the glass. Becomes immensely satisfying as it warms and opens. Delicious and complex. BearScore: 93+.